Rod Davis was born in Liverpool in 1941 and lived for his first twenty years in the village of Woolton, about six miles south of the city centre. Somewhere around 1946 John Lennon went to live with his Aunt Mimi and she sent him to Sunday school at the local church, St. Peter's. John joined a class of a couple of dozen kids which included Pete Shotton, Nige Walley, Ivan Vaughan and Geoff Rhind and Rod himself, all of whom would play a part in the story of The Beatles. In 1952 he started at Quarry Bank School, and found himself in the same year group as John, Pete and another Woolton lad, Eric Griffiths. Inspired by hearing Lonnie Donegan's recording of "Rock Island Line" blaring from a record shop, he pestered his parents to buy him a banjo or a guitar (Donegan played both). Finally he wore them down and boasted about his new banjo in school next day, whereupon Eric asked him to join the budding skiffle group which was soon to become the Quarrymen. Virtually all of our repertoire was pinched wholesale from Donegan who had become a top star during 1956. In the very early days the group played at Youth Clubs and in the interval at local dances. A breakthrough came in January 1957 when the Cavern opened its doors for the first time and the Quarrymen were invited to play there several times with Rod on banjo. Their two most famous gigs of this era for which photographs still survive were Rosebery Street in June and St Peter's Church Fete on 6 July 1957, the fateful day when John met Paul and the Beatles really began. The Quarrymen were becoming more of a Rock 'n' Roll outfit and as a banjo player Rod didn't fit in too well so he drifted out of the group during the summer of 1957 and by the autumn Paul McCartney had taken his place in the lineup. After leaving the Quarrymen Rod decided to learn the guitar and so with his brother Bernie they sold their old electric train set and bought a Spanish guitar. As they knew the principles from the banjo, they soon learnt enough guitar chords and became very interested in folk music, both from the British Isles and from America. Rod stayed on at Quarry Bank into the sixth form until December 1960 when he won a scholarship to Cambridge University to study Languages where he became a member (and eventually President) of the University St. Lawrence Folk-Song Society. He soon became a Bluegrass addict and began to play mandolin and fiddle. After Cambridge he went to teach English in Regensburg in Bavaria from '63 to '64 where he played banjo in a trad jazz band. Back in Liverpool in '64 Rod became a member of the Bluegrass Ramblers, playing mandolin and fiddle. They appeared on "Opportunity Knocks", hosted by Canadian Hughie Green but alas opportunity didn't knock! He taught French and Spanish until 1968 when he became an expedition driver for a company called Minitrek Expeditions, taking trips to Russia, Turkey and across the Sahara desert. In 1970 he married one of his former passengers and settled down behind a desk, working for holiday companies in the London area whilst taking a post-grad Marketing qualification in his spare time. He developed his Old Timey Fiddle technique in a well-known musicians' hangout in Chalk Farm in London, a pub called "The Engineer ". In the early 1980's he played guitar for a Tex-Mex band called the Armadillos with Tony Engle (of Topic Records fame), appearing at folk festivals and folk clubs throughout the country. In the mid 1980's with some friends from Liverpool they revived the name of the Bluegrass Ramblers which became a very successful band, playing Britain's top Bluegrass Festival at Edale and supporting big US names such as the Johnson Mountain Boys when they played in London. In the mid 80's he met his new partner, Janet, and they soon became very keen windsurfers, racing in the London Region and National events. He also started lecturing in Tourism at Uxbridge College, moving later to Brunel University where he lectured in Tourism and Marketing until his retirement in 1996. In 1997 after a 40th Anniversary Party at The Cavern they revived the Original Quarrymen of 1957, with all five members of the band who were on stage with John Lennon the day he and Paul McCartney first met. Since then the group has played dozens of gigs on both sides of the Atlantic and also in Russia and Japan. They produced two cds containing Skiffle and Rock 'n' Roll played in the same style as in 1957 with washboard and tea-chest bass, followed by a dvd in 2009. 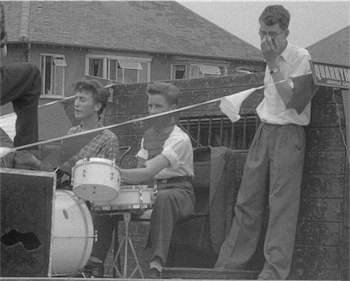 The Quarrymen are still playing the occasional gig even now in 2014! Having been first a teacher, then a university lecturer, Rod is very much at home entertaining an audience with tales of how the music scene developed in the mid fifties and of growing up in Liverpool and attending the same school as John Lennon and playing in his first group. In late 2009 he toured Canada with bluesman Guy Davis, performing a 45 minute set peppered with anecdotes – see reviews below. Rod's talk involves members of the audience learning at first hand how a Skiffle Group functions, getting them sitting in on washboard and the tea-chest bass as he plays guitar, re-creating the early days of the Beatles. Visiting students from the USA, music students from Brunel University, groups of German Beatles fans on holiday in Britain, fans at Liverpool's Cavern and at Beatles Conventions and many more have been fascinated and amused by this unassuming old man and his memories.